Well with the number of cushions I’m churning out right now, my backside will certainly be well padded if I perch on them… (actually even if I DON’T perch on them :o/) Anywho, one of my FAL goals was to rehouse the orphaned blocks from FPPFTT, and block #5 seemed to be screaming to become a cushion. Not one to ignore screaming fabric, I dug out some Klona black (my go to partner for rainbows right now seems to be grey or black) to border and back it, using a simple envelope back. I debated about quilting it, and then decided that really, quilting would be lost in the riot of colour and patterns, so to keep the block seams nice and secure, I opted to just back the front section with some fairly light fusible woven interfacting. I French seamed the entire cushion so there weren’t any raw edges to wear away inside either. As projects go, this was a pretty quick and simple finish, but anything that reduces that pile of random, single blocks is a win in my book! Finishing it quickly does not make it any less beautiful. I love it! That is a cuuute cushion! this is gorgeous! the black totally makes it pop! This cushion does not want to be ignored – it shouts me me me me! And knows it will turn heads! You sure are getting off to a big start in the FAL! It was a fab block to begin with but it looks even better now! Lovely! It's beautiful! The black was indeed the perfect choice. Great finish. Oooh smashing. Just about to sew down the binding on the rocket cushion!! It`s gorgeous and bright and lovely! You seem to have a rainbow thing going on, might have to start calling you Dorothy. Great cushion tho. very nice. Love the rainbow combined with black. I know, I've got a lot of those random blocks too. Cushions are a great idea to use them up. Love the colors in this one. i love this one tons katy! I just loved this block when you first shared it. Nice job! I think if I had made that block it would still be sitting somewhere. Kudos to you for taking initiative and turning it into something useful! 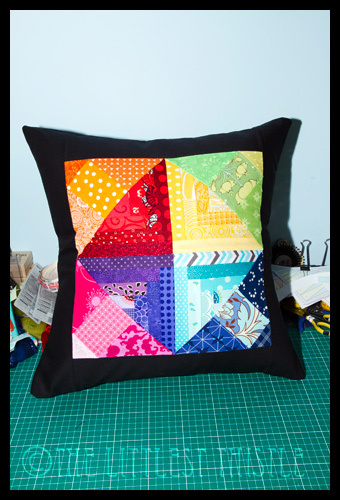 I really like that cushion, black works so well with the bright rainbow. Great use for the blocks – and it makes the colours shine!